The costumes designed by Jenny McNee are a key clue; she seems to have been inspired by either a 1920s illustration of a circus or a 1968 acid trip with the Beatles. 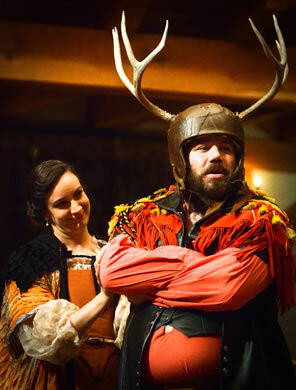 Falstaff (Rick Blunt) wears antlers in his final rendezvous with Mistress Ford (Stephanie Holladay Earl) in the American Shakespeare Center's production of The Merry Wives of Windsor. Photo by Pat Jarrett, American Shakespeare Center. For those of you who remember the television sitcom Happy Days, try to recall the series' first couple of seasons rather than the last. Those early episodes included a peripheral character, a leather-clad high school dropout named Arthur Herbert Fonzarelli. On the strength of the character itself more so than the actor playing him (though that actor, Henry Winkler, was very good), "Fonzie" became the show's centerpiece role and a cultural icon. Even his ultimate failure as a fictional character has entered the English lexicon as "jumping the shark." Thus it was with Sir John Falstaff. William Shakespeare created the fat knight for his Richard II sequel, a history play about Henry IV, and the character took over that sequel's sequel, Henry IV, Part Two, and got his own spin-off with The Merry Wives of Windsor. Don't fret my casting Falstaff and Fonzie in the same cultural plane, for the former begat the latter, as well as Kramer in Seinfield, Barney in How I Met Your Mother, and Jack and Karen in Will & Grace. In fact, The Merry Wives of Windsor begat the modern sitcom. 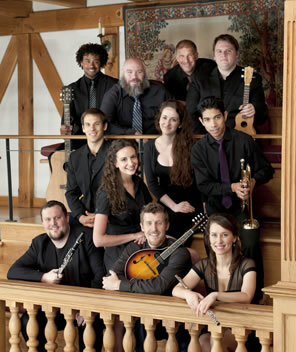 This is the takeaway from the Rob Clare–directed version of Shakespeare's play that the American Shakespeare Center's World's Mine Oyster Tour troupe is taking on the road. Seek ye not for deep humanistic soundings, Shakespearean imagery arcs, and dark undertows in this production, though those are certainly in the play because Shakespeare couldn't help himself. If, as legend has it, Shakespeare wrote this comedy in a couple of weeks at the behest of the queen, he would then have begat the modern TV script writer, too, churning out funny stuff week after week. To meet his assignment, Shakespeare would have drawn on what he knew best, the modern (for him) middle class, and what he knew would work best, commedia dell'arte conventions he had already employed in several of his plays. The result: something with all the cultural resonance of Three's Company and Married, with Children. Not that there's anything wrong with that. In fact, because Clare demonstrates how Shakespeare can be crazy, mindless fun with this production, I believe there's much right with that. This is an unabashedly over-the-top production, as the company is not charged with formulating great character studies; they set out to make people laugh, and they seem to be having just as much fun with the play as the audience. The costumes designed by Jenny McNee are a key clue; she seems to have been inspired by either a 1920s illustration of a circus or a 1968 acid trip with the Beatles. Bardolph (David Millstone) appears in shoulder pads and goggles, Nym (Emily Joshi-Powell) wears a helmet with a face guard, and Pistol (Patrick Midgley) sports an eyepatch and flight cap. Falstaff (Rick Blunt) looks like a pirate on a Mardi Gras float, and he and his gang all wear red tassels dangling from their shoulders and jackets. George Page (Fernando Lamberty) and Frank Ford (Patrick Earl) wear richly brocaded renaissance vests over late Victorian-era striped pants. Their wives (Bridget Rue and Stephanie Holladay Earl, respectively) are elegantly clad in silk 1597-gowns that yet look like 1957 cocktail dresses. Fenton (Joey Ibanez) is a leather-clad biker, a la James Dean, and Slender (Midgley, again) is in a red and black rugby sweater, red sweat pants, and as dirty a pair of multicolored tennis shoes as you will ever find in your son's bedroom—oh, and he accessorizes this with a gold brocade cape. The acting is just as loud and boisterous as the costumes. Millstone as Dr. Caius gets tons of mileage out of the Frenchman's go-to oath, "By gar," and plays up his French accent to an extreme just this side of understanding his English. Colin Ryan is likewise fluently Welsh-accented as Sir Hugh Evans, and it brings home the jokes of the Latin lesson scene so well that people in the audience don't know whether to cover their children's ears or clean their own, thinking they misunderstood what is being said (when a production has an Evans and a Mistress Quickly, here played by Russell Daniels, this adept at Shakespeare's nuanced inflections, it would be criminal to cut this scene so underappreciated by many directors). The Earls—a married couple in real life—go large in their portrayals of the Fords. Stephanie plays Mistress Ford as subtly as a One Direction fan, a ball of giddiness that might seem out of place for a society wife in the burgh where England's queen lives. She can't wait to get to the next prank, whether it's on Falstaff or her husband. Meanwhile, Rue operates in the opposite extreme, presenting Mistress Page as a calmly conniving self-righteous woman. Patrick Earl wears Ford's jealousy on both sleeves—and his lapel, too. Heck, he wears his jealousy like the trench coat, hat, and sunglasses he uses for his disguise as Brook. He generates some of the production's biggest laughs in his scenes with Falstaff, reacting behind the knight's back as he learns of upcoming trysts with his wife and the manner in which Falstaff escaped Ford's grasp in the first tryst. The first buck-basket scene is an automatic laugh machine, but Earl gets more volume in the second buck-basket scene when he dives into the laundry bag, feet sticking up through the piles of clothes. The best barometer of this production's aesthete is in the fact that Blunt as Falstaff provides the most restrained performance. Wisely done. Blunt, who also is playing Falstaff in the tour troupe's Henry IV, Part One, apparently takes to heart what many critics complain about, that Shakespeare demeans his fat knight in Merry Wives. Blunt dials down the crude Falstaff he played in Henry and turns up the fat knight's self-delusion—a delusion that nevertheless comes off nobly. This Falstaff tries to impress the Windsor crowd with his courtly ways, and the comedy of consternation comes when he's constantly finding himself in fixes, from buck baskets to old lady disguises to standing in a park in ridiculous antlers that lead him, respectively, to a dunking in the Thames, a beating by Ford, and pinches and singes from supposed fairies. Master Ford (Patrick Earl) comes up empty in the buckbasket as one of his servants (Patrick Midgley) watches warily in the American Shakespeare Center's Merry Wives of Windsor. Photo by Pat Jarrett, American Shakespeare Center. Blunt also gives due respect to his lines as written: Shakespeare fills Falstaff's speeches with many one-liners, the kind of jokes upon jokes you'd get in a typical episode of Friends, and Blunt employs perfect timing in delivering them. His is a seriously funny Falstaff. Blunt's Falstaff is just one example that this Merry Wives has real heart, for all the knockabout comic playing in this production. It's there when Patrick Earl's Ford seeks and is granted forgiveness by his wife, when Lamberty's Page extends a genuine blessing with a firm handshake to Ibanez's Fenton, when Ford's servants look warily at the second buck basket, and when Midgley's Slender admits to Anne Page that he really isn't keen on romance and wants only what she desires. Joshi-Powell gives young Anne Page a delightful moment when her parents, in turn, excoriate Fenton; Joshi-Powell shifts into whining teen posture and speaks a barely audible "Daaaaad!" and "Mooooom!" that may not be Shakespeare but is just so right. But, if you simply must indulge in an academic approach to Shakespeare when attending one of his plays, take notice of how this troupe of 11 actors pulls off the 22-part play (though Falstaff's page has been totally cut). Daniels as Mistress Quickly must do one scene with his head poking out the curtain at the back of the stage because he will be coming out in the next instance as the host. And when Slender courts Ann Page, he turns for help to Mistress Quickly rather than his uncle Shallow because Ibanez, who plays Shallow, is already on stage in his role as Fenton. Yet, the marvel that is Shakespeare is very much in play with this production as you realize that he wrote a sitcom in, allegedly, 14 days that's essentially still airing in syndication some 415 years on.